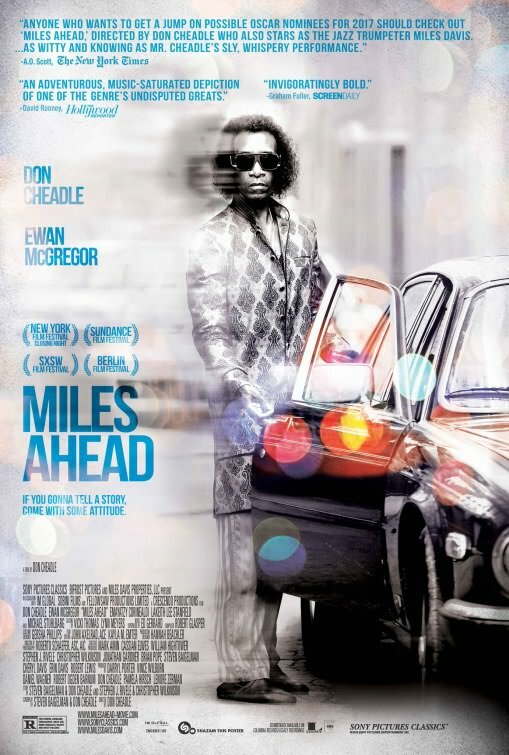 Don Cheadle (Hotel Rwanda) makes his directorial debut in the superb, frenetic portrait of legendary jazz musician Miles Davis and starring in the main role in the brilliant film Miles Ahead which premiered at the 37th Durban International Film Festival http://www.durbanfilmfest.co.za/ . If the 2017 Oscars are looking for more diversity they should look no further than Don Cheadle’s wonderful performance, so captivating, energetic and entrancing. Cheadle should definitely earn an Oscar nomination for this studied and embracing performance of a jazz icon, that he holds in high esteem. 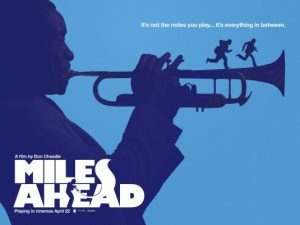 Set in New York at the end of the 1970’s Cheadle plays a reclusive Miles Davis who along with struggling a multitude of additions has not release a new album in years. In steps Ewan McGregor as the brash Rolling Stones journalist Dave Brill who coaxes Davis out of his liar to confront his own demons and a music business which is cut throat dangerous and down right greedy. Through a series of perfectly placed flashbacks audiences get a glimpse of an earlier version of Miles Davis as he begins courting the gorgeous dancer Frances Taylor wonderfully played by the beautiful Emayatzy Corinealdi who was last seen in the stunningly brutal mini-series Roots. As Miles and Dave embark on a frantic search for a recording of some his new music which was unfortunately stolen at a wild party at Davis’s New York apartment, they come across the shady and almost unrecognizable Michael Stulbarg last seen in Trumbo as gangster Harper Hamilton who has vested interests in the music business. Watch the brilliant 1970’s series Vinyl for more substance on this topic. 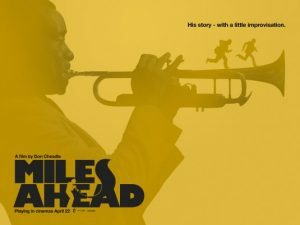 At the heart of Miles Ahead, is Miles Davis’s passion for brilliant music and his understanding of how classical music informed the evolution of the jazz movement which many in the establishment regarded as risque. Interestingly, Miles Ahead, also makes a strong point about racial integration as Davis was definitely a man who had been prejudiced against and he desperately wanted to smash any racial stereotypes. In one scene in the film, Miles Davis is even arrested by a bigoted cop outside the venue where he is performing for loitering. The dynamic scenes between Cheadle and McGregor make Miles Ahead so fascinating as they race around New York fuelled by drugs and alcohol to find the missing jazz score. More importantly, fans of Miles Davis will love the soundtrack as a jazzy jive which keeps the film fresh, funky and absolutely engaging. Miles Ahead is highly recommended viewing, an entertaining portrait of the legendary Miles Davis who by his attitude and music was definitely way ahead of his time.